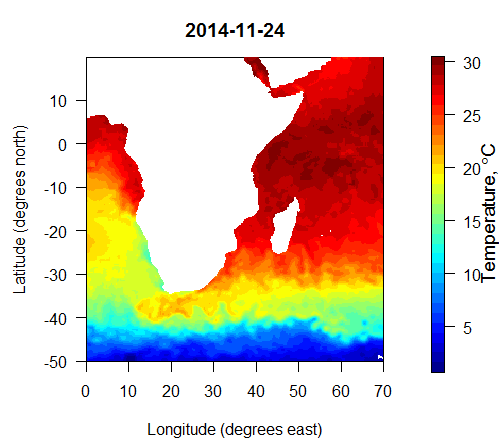 Ocean temperatures around Africa for 2014-11-24.
extractOISSTdaily() – extract gridded data from the high resolution files that contain daily SST values for a whole year that can be found at http://www.esrl.noaa.gov/psd/data/gridded/data.noaa.oisst.v2.highres.html. extractOISST1day() – extract gridded data from a single-day high resolution file that can be found at http://www.ncdc.noaa.gov/sst/griddata.php. extractOISSTweekly() – extract 1×1° gridded weekly mean SST values from one of the two big compilation files found at http://www.esrl.noaa.gov/psd/data/gridded/data.noaa.oisst.v2.html. plotOISST() – a basic plot of the output matrix from the other three functions. fname – the path to the OISST NetCDF file (a .nc file). lsmask – the path to the land-sea mask file (a .nc file). lonW – the westernmost longitude of the area you want to extract (0 to 359). lonE – the easternmost longitude of the area you want to extract (0 to 359). This argument can be left out if you only want data from the grid longitude closest to lonW. latN – the northernmost latitude of the area you want to extract (-89.5 to 89.5). This argument can be left out if you only want data from the grid latitude closest to latS. date1 – the starting date of the time period you want to extract. This should be a R date object or a string specified as “2014-11-25”. This argument isn’t used in the single-day extractOISST1day function. date2 – the last date of the time period you want to extract. This should be a R date object or a string specified as “2014-11-25”. This argument is optional in the first two functions if you only want one day’s data. This argument isn’t used in the single-day extractOISST1day function. Reynolds, Richard W., Thomas M. Smith, Chunying Liu, Dudley B. Chelton, Kenneth S. Casey, Michael G. Schlax, 2007: Daily High-Resolution-Blended Analyses for Sea Surface Temperature. J. Climate, 20, 5473-5496.